Thinking through interior design is a very exciting activity, and even useful. It is necessary to take into account so many nuances: decide on the style of the future interior, choose finishing materials, figure out how they will combine with each other, solve the problem with placing everything you need in a limited area and so on. 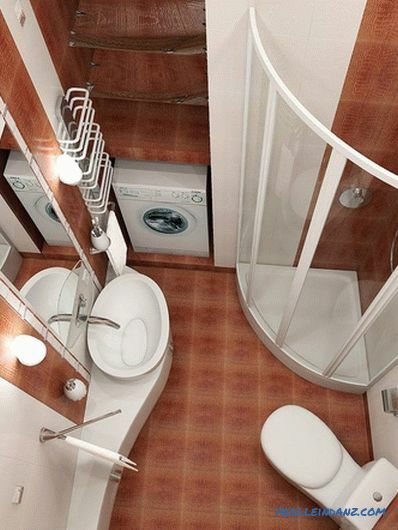 The bathroom interior can be made in various styles: from high-tech to classic, from avant-garde to provenance. 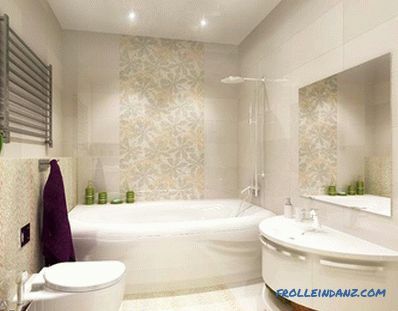 Another thing is that most of us live in ordinary standard apartments, where the bathrooms do not differ in a large area, so the design possibilities and the realization of the characteristic features of some style solutions are somewhat limited. 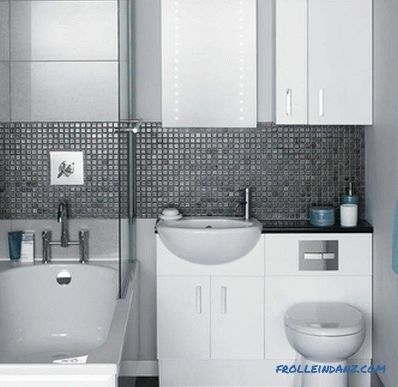 The design of the bathroom in such small rooms should be concise, and the main task of the designer is to think over the options for the most convenient and aesthetic placement of sanitary ware and furniture. In small bathrooms, everything should be in place. 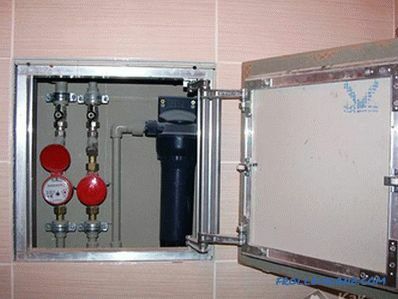 Therefore, the design tasks are to usefully use every centimeter. 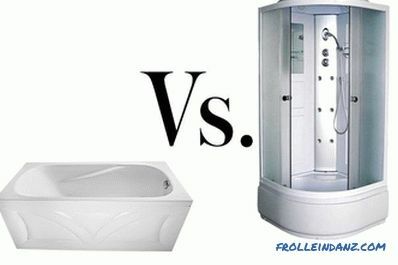 Both of these options have their advantages and disadvantages Think about whether to abandon the bath and replace it with a shower, because then there will be enough space to install a washing machine, and in the bathroom it will not be cramped. 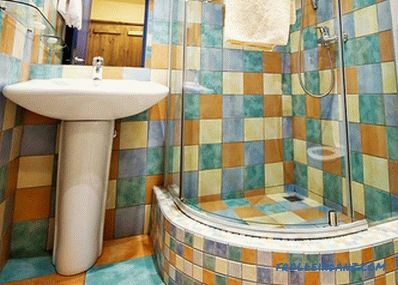 If a bath is necessary, keep in mind that sometimes a washing machine is installed under a special-purpose sink or in a niche above a wall-hung toilet, if there is no place for it anywhere else, for example, in the kitchen or in the pantry. Mirror cabinet The bathroom always keeps a lot of hygiene items, therefore need to organize storage places. 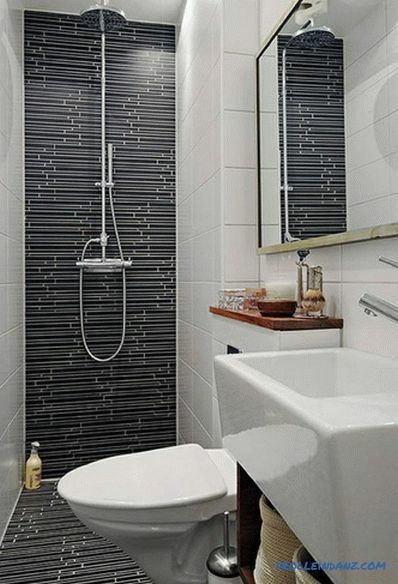 This can be an open or closed corner shelf above the bath. 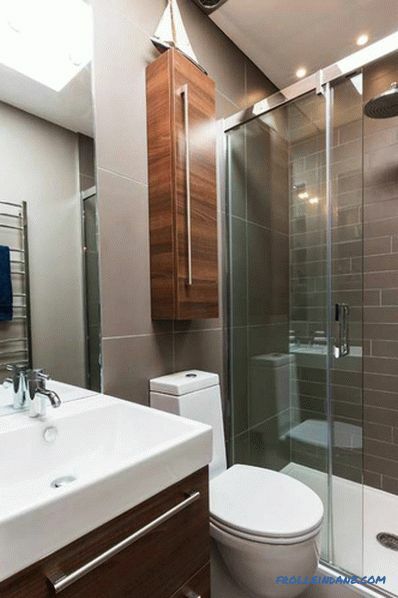 By the way, you probably saw the sale of bathroom sets consisting of a washbasin and a narrow hanging cabinet with a mirror - do not neglect them. 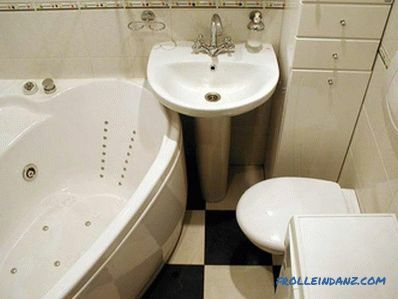 In a small bathroom, such furniture is a real salvation. It takes up little space, but washing powder, cleaning products, shampoos, gels, toothbrushes and other various accessories will no longer be gathering dust on the open shelves and surfaces, which will always help to keep the bathroom in order. 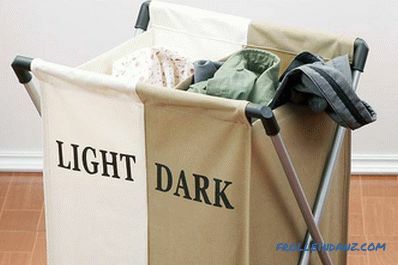 Such a bag will suit the storage of dirty laundry A catastrophic problem in a small room for many housewives is the definition of storage space for dirty laundry. Often, not finding another way out, the laundry is immediately put into the drum of the washing machine and thus accumulated. 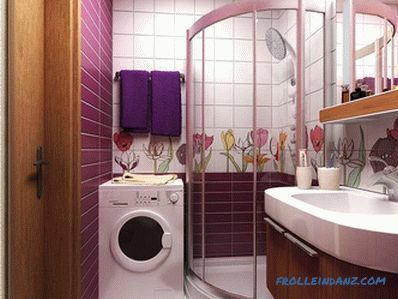 However, this will not affect the laundry in the best way: things can not only get an unpleasant smell in the damp drum of a washing machine, but even become damp and moldy. It is much more practical to have a laundry basket or bag. Get a narrow but high model. 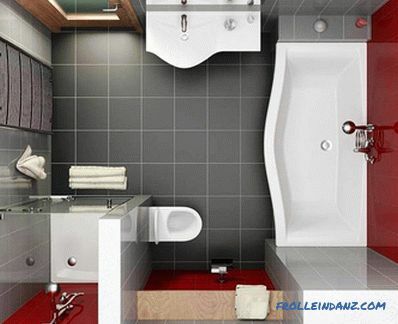 The accessory will be quite roomy, and you can even place it in any corner, at least between the washbasin and the wall. 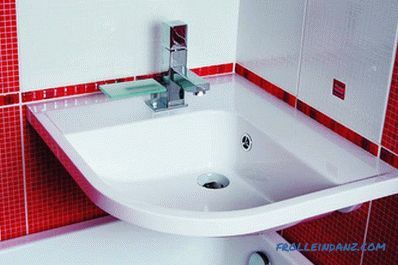 The corner sink can save you a few centimeters Some people dream of a corner bath . 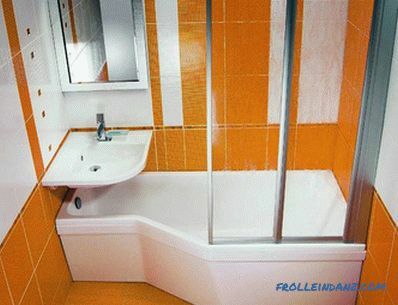 It is a mistake to think that it will help save space, even if you purchase small models and install them in place of the old bath. 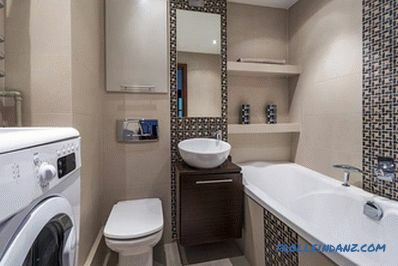 Think a hundred times, because the narrow space formed between the bathroom and the wall is unlikely to be somehow involved. 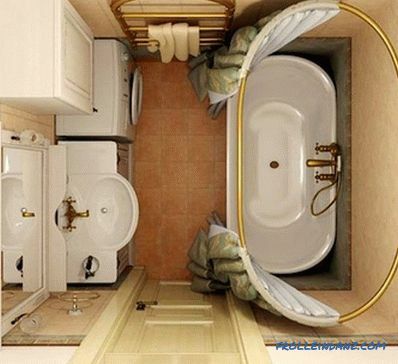 But at the expense of the width of the bath "eat" really useful centimeters. 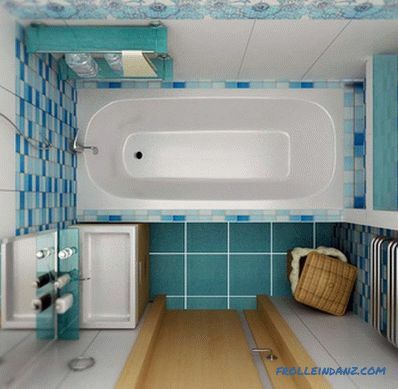 In a small bathroom you should not install a corner bath. 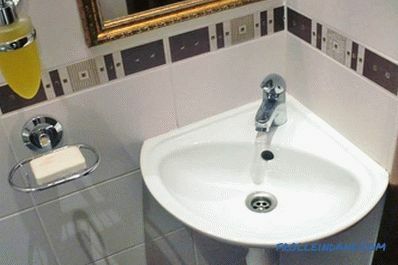 But the corner sink - exit. 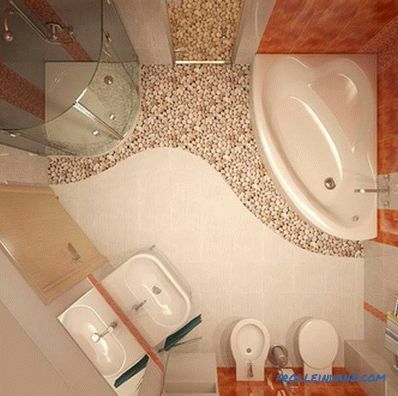 The sink over the bathtub will release even more space The sink can be partially or fully positioned above the bath. Or a part of the tabletop can hang over it: not bad and functional. In the first case, space is saved, in the second - while taking a bath on the tabletop, you can put cosmetics on the tabletop, put a towel. 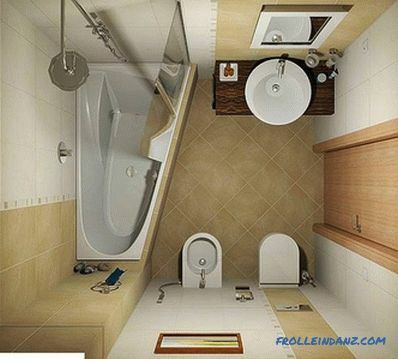 Typical bathroom layouts are not diverse. In the combined bathrooms there are a toilet, a washbasin and a bathtub along a long wall, and the toilet is closer to the stand. 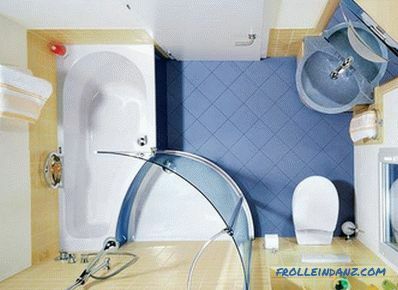 In separate bathrooms, the bathroom is even smaller, as the toilet is moved to a separate room. 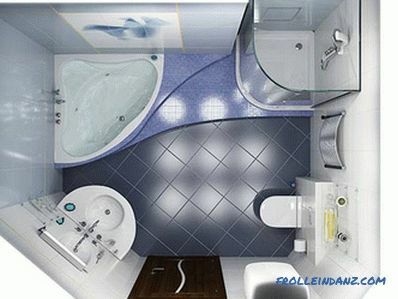 To create an interesting interior design in such cases is extremely difficult. 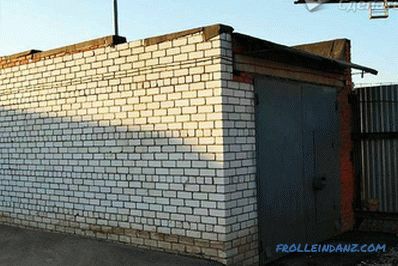 Exit - redevelopment. 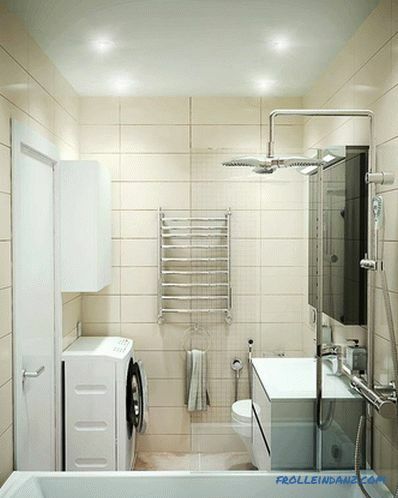 When combining a separate bathroom, some useful space will appear due to the possibility of using side walls, for example, if you lay the door of the former toilet. 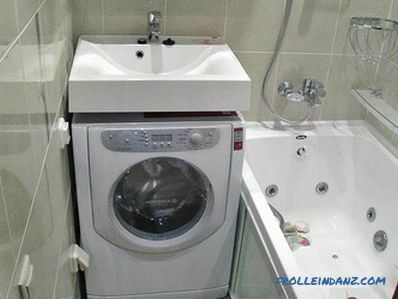 Next to the toilet or in front of it, you can install a washing machine. 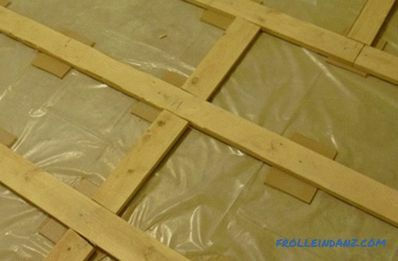 If the bathroom is combined, then it can be expanded by joining a corridor or a storage room, if it is located through the wall.In these cases, the design possibilities are significantly increased, however, it is necessary to work on waterproofing. 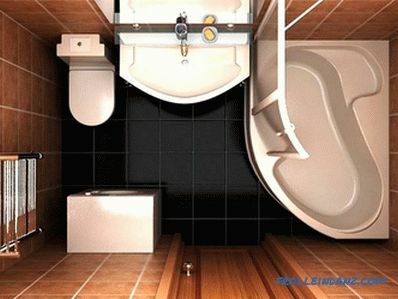 By the way, connecting the pantry area to the bathroom separate bathroom in it, you can install a second toilet. The first will remain in its place. 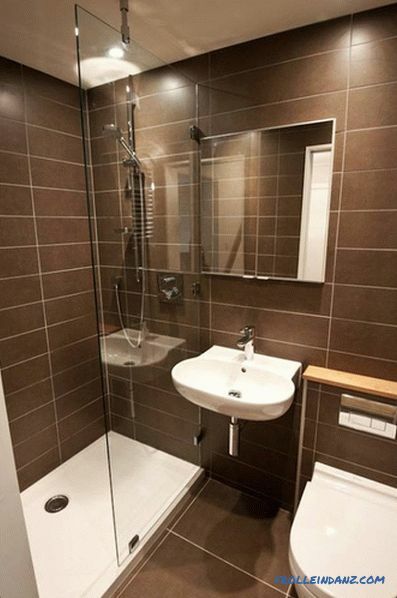 Refine this room by installing a miniature sink there. Avoid tiles of large forms. 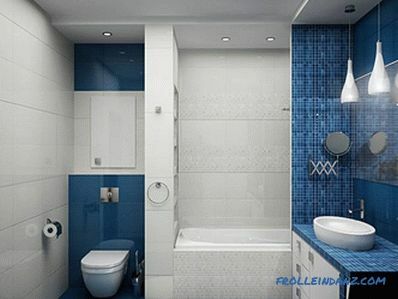 For wall cladding and bathroom floors are traditionally used tiles. 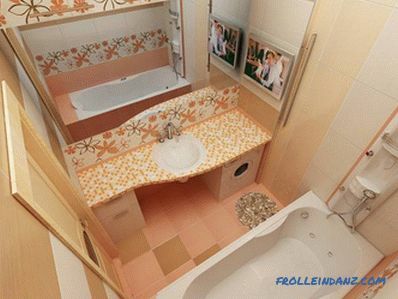 But in small bathrooms, large squares, and even with a picture, will look awkward. 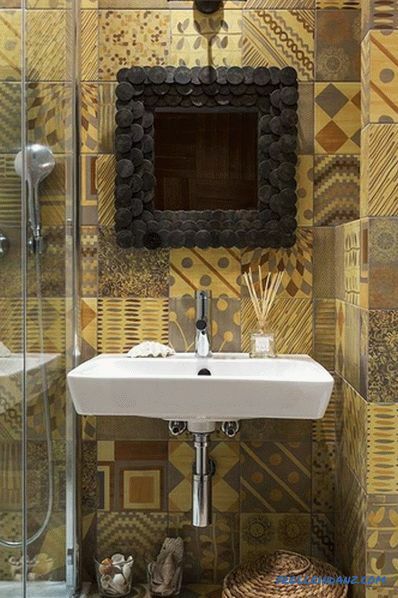 Choose a medium-sized tile with a glossy surface, such as a glass mosaic. 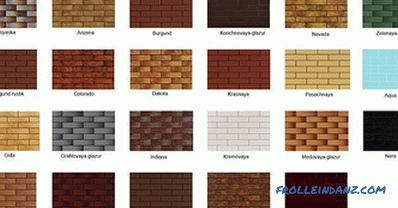 The panels made of mosaic look great. 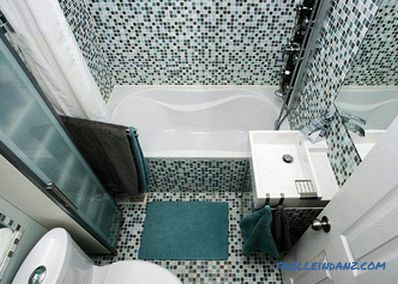 One of the walls, for example, adjacent to the bath, can be trimmed with mosaics, while others can be slightly larger with tiles of a different color, for example, 5 * 5 cm. 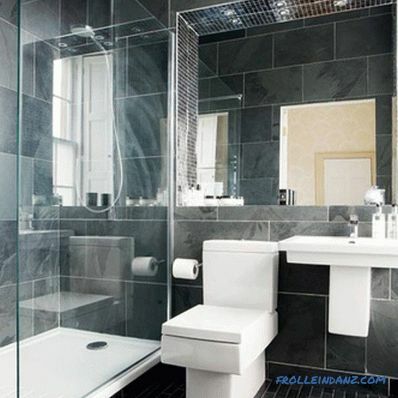 A large bathroom mirror will not hurt, regardless of the size of the room. 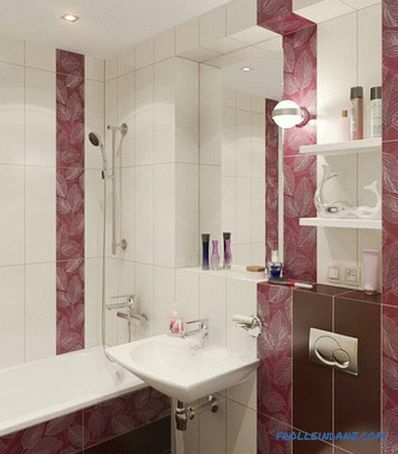 Place shallow plasterboards in the bathroom. They will perfectly play the role of shelves. Even better, if you build them backlight. As for lighting, it should be varied. Do not limit the three spotlights on the ceiling. 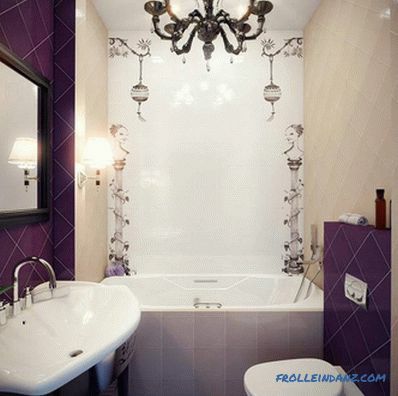 Place wall lamps near the mirror. 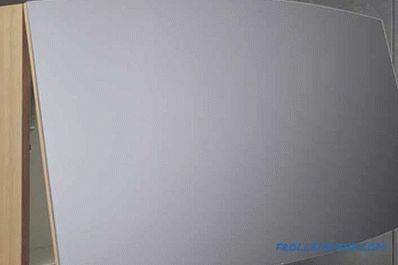 Highlight the shelves using LED strip - the color of the lighting can be changed. If desired, you can even organize a backlight built into the floor. 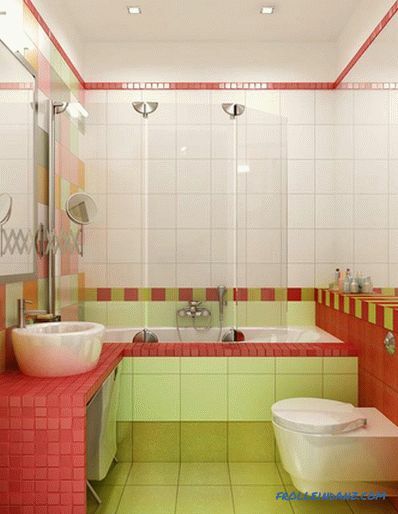 Choose light and pastel shades as primary colors for your bathroom. You can make a slight bright color accents. 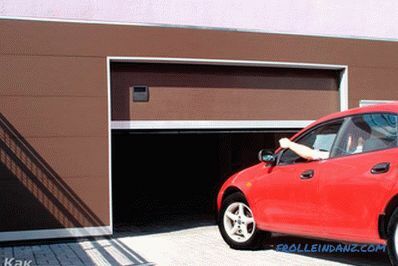 To save space, sometimes a sliding door or an accordion door is installed. However, please note that without additional modifications such doors will not be able to provide an adequate level of insulation of the room. And one more thing - lockers on the doorway. This space is rarely used - but in vain. Here you can organize a convenient storage space.